Football is back! NFL pre-season games are here as well as 2012 Topps Football Cards. Packs and boxes are on retail and hobby shelves ready to go. The 2012 rookie draft class looks as promising as last year’s and Topps Football features them in many different ways including retro inspired Tall Boys inserts, 1957 reprints and rookie card variations. For this current release of Topps Football it is also the year of the Quarterback. The base set comes in at 440 cards and is paralled in Gold #/2012, Breast Cancer Awareness (BCA) Pink #/399, Military Camo Border #/399, Black Border #/57, Platinum 1/1s and 1/1 Printing Plates. There are Rookie and Veteran Photo variations. (Keep checking back for out Complete Visual Checklist of the photo variations.) Inserts sets include QB Rookie Reprints, Quarterback Immortals and Field Generals inserts. There is also a wide variety of Memorabilia and Autograph Cards. Parts of the set will seem familiar to collectors but there is plenty that is new to Topps Football in 2012. The Quarterback Immortals utilize the current hot QBs and legendary heroes who played the position at the highest level. There are Field General Inserts complete with a military style medal embedded in the card. NFL Milestones inserts come with a 2-sided die cut medallion on card. QB Immortal Plaques featurie legendary QBs immortalized in bronze on card. Sequentially numbered Game Winning Drive inserts featuring retired and current QBs with filmstrips commemorating moments they drove their team to last minute victory. Die Cut MVP and Super Bowl MVP Trophy cards honor MVP Seasons and Super Bowl MVPS, both retired and current QBs Quarterback Immortal Autograph cards and Relic cards feature Legendary Hall of Fame quarterbacks like Joe Montana, Dan Fouts, Roger Staubach and more. 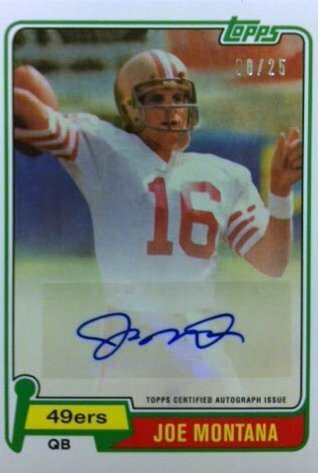 Also found in 2012 Topps Football are reprints of the rookie cards of some of the greatest QBs of all time and they are autographed. 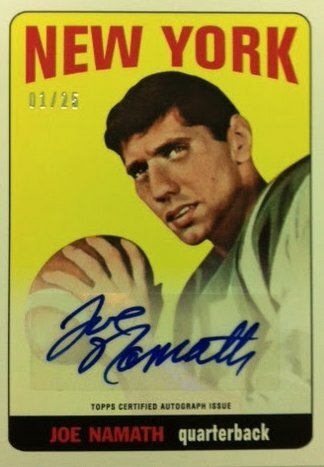 You could find autographed rookie reprints of Joe Montana, Bart Starr, John Elway, Joe Namath, Roger Staubach, Steve Young, Warren Moon and more. Each reprint is numbered to 25. 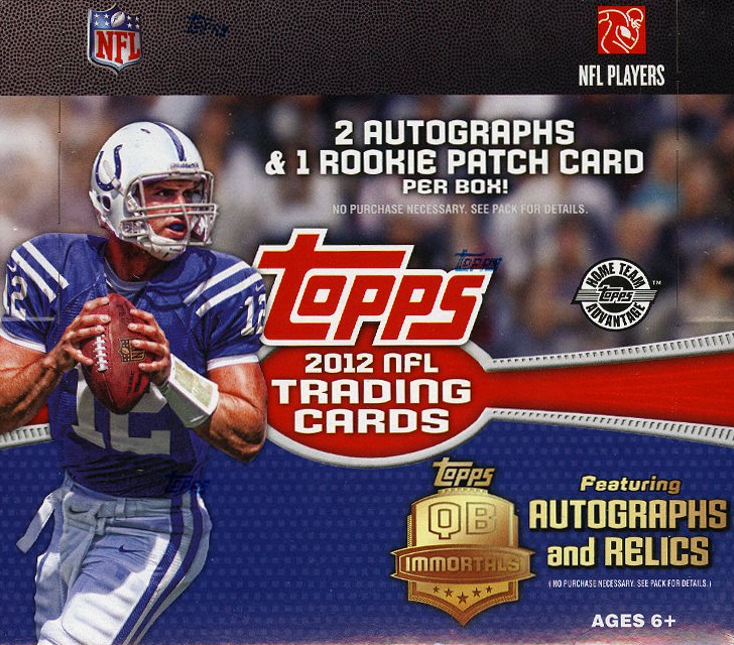 If you are looking for rookies, Topps Football has the newest members of the NFL including, Andrew Luck RG3, Justin Blackmon, Trent Richardson and more in a wide variety of cards that include on card autographs, retro designed cards, and special inserts like NFL Rookie Premiere Cards that are autographed on-card, featuring the rookies who attended the NFL Rookie Premiere at the Rose Bowl earlier this year. 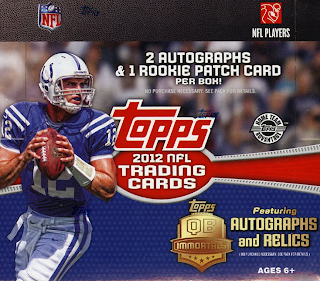 There are exclusively designed autographed cards featuring the two hottest draft picks Andrew Luck and RGIII that will be featured throughout all of the Topps Football products this season making their debut in 2012 Topps Football. Topps will also be going retro with designs based on their football cards from 1984 (Rookie Autographs) and 1965 (Tall Boys). There will also be those great looking Clear Acetate Die Cuts that we have mentioned before. Another exciting feature will be Golden Draft Tickets found in both Hobby and Retail boxes of 2012 Topps Football. Collectors who find these draft tickets will receive an autographed Andrew Luck or RG3 Football from the 2012 NFL Rookie Premiere and one lucky collector will be drafted by the Topps Football Team and will be featured as a rookie in 2013 Topps Football on a card. One item that will be exclusive to hobby packs are special Kickoff Weekend Redemption Cards. If you find one, you can redeem the card at your favorite Hobby Store during NFL Kickoff weekend, (September 5th through September 11th ) and you will receive an exclusive 5 card Topps Kickoff Pack. The kickoff pack may include autograph cards from NFL Legends and Rookies. The online giveaway site for this year is called Game Time. GameTime code cards can be found in both hobby and retail packs. Some codes will unlock exclusive cards and most will unlock tokens to play GameTime. Put your football knowledge to the test and play weekly games based on real NFL outcomes. You can win weekly prizes and season long prizes based on your performance. Prizes include limited edition autographed cards, autographed helmets and footballs! If you find a GameTime code card hold onto it. 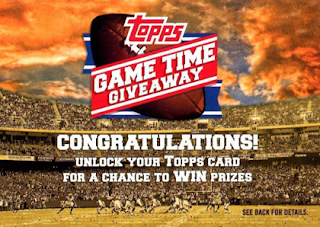 Collectors will be able to start unlocking tokens and cards at Topps.com/Gametime within the next two weeks. Topps will make an announcement on facebook.com/Topps and on Twitter @toppscards when the GameTime site is available. Actual game play will begin with the start of the NFL season in September. Very tough to say without a picture, but a safe guess for a non-perfect non- alternate version base card of Luck, you might be looking at 2 - 3 dollars. Saw the picture on the Topps Facebook page. Unfortunately what you have there is a printing error. For it to be the kind of error that increases the card's value, it would have to be a typo that was later corrected and only a small number of the typo cards were released. So if the card had read something like "Andrew Kuck" and only about 100 of them were put in packs before Topps changed it to "Luck" you would have a valuable card on your hands. Errors like yours where ink is missing or the card is miscut or has centering issues actually decreases the value of the card because it will not receive a high grading if you send it to a company like Beckett or PSA. If you just plan on holding on to it, it really makes no difference what the value is because the printing error is minor. In the future, if you wind up pulling a card with a printing error, there is a chance that you can get it replaced, but that will require proof of purchase and sending the card back which might actually cost you more than the value of the card. If that is the way you want to go, make sure you contact the company's customer service department to see if it is considered enough damage to be eligible for replacement. Just pulled an autographed rookie reprint auto of Aaron Rodgers, 21/25. Can't find the value of it anywhere. Any guess? Wow! Nice pull. A few of these have sold recently on eBay. Average price seems to be around $300. Just pulled a signed John Elway QB Immortals gold card! 1/10# Anyne know how valuable this card might be? I have a Robert Griffin III Rookie Card #340, but it has a magenta border around it. I cannot find ANYTHING online in regards to what it's worth. I remember reading on the box that the odds for the magenta were like 1 in 4,000 or something along those lines. Can anyone help me out? eBay...Amazon...Google....nothing in regards to the colored borders.